We are now shipping the King of Fighters 2004 (Neo Wave) Dedicated Machine - a twin versus cabinet version. The King of Fighters 2004 (Neo Wave) is the latest update in the popular King of Fighters series of games, and this Machine allows two players to compete against one another in a battle of the characters in their teams. Each player chooses a team of three characters from previous versions of the game, and then the two players battle their characters against each other. The teams each player can choose characters from in the King of Fighters 2004 (Neo Wave) are; the Japan Team - Benimaru, Kyo, Goro; the '98 Boss Team - Shermie, Yashiro, Chris; the '97 Team - Billy, Blue Mary, Yamazaki; the Wild Card Team - Kula Diamond, Saisyu Kusanagi, Shingo; the '99 Team - Whip, K', Maxima; the Fatal Fury Team - Terry, Andy, Joe; the Art of Fighting Team - Robert, Ryo, Takuma; the Korea Team - Choi, Jhun, Chang; the Iori's '96 Team - Iori, Vice, Mature; the Psycho Soldier Team - Chin, Athena, Sie Kensou; the Woman Fighters Team - King, Mai, Yuri and the Ikari Team - Leona, Clark, Ralf. King of Fighters 2004 (Neo Wave) features a number of modes players can make use of to give them advantages in the game over their opponent. Heat Mode makes a character flash red and gives them more power, but at the same time, decreases their health. Guard Break Mode gives a player the ability to break their opponents guard, while Super Cancellation Mode allows a player to cancel special moves at the last minute into other special moves to surprise their opponent. Max2 Mode automatically increases a characters power gauge, but limits their ability to do some other moves. In Japan this machine can be hooked up to Internet servers for Internet ranking purposes and tournaments. Outside Japan, the memory cards can still be purchased, however players cannot register their ranking, and the card can only display the player's win / loss ratio. 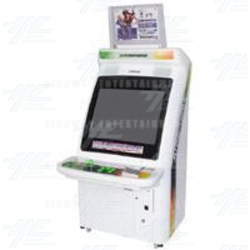 King of Fighters 2004 (Neo Wave) Dedicated Machine is available for immediate shipment (FOB Japan) at a cost of US$6995. PICTURED: Atomiswave cabinet with card reader.